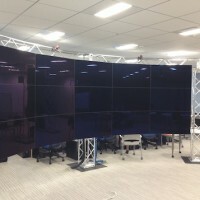 24-screen Flat Stereo Visualization System is composed of 24 50-inch Full HD (1920x1080) stereo projection module (Barco OLS-521), Image-Processing PC cluster driving visualization processing on 24 screens. A notable feature of this visualization system is that it enables approximately 50 million high-definition stereo display with horizontal 150 degree view angle. 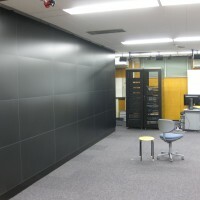 Also, it is notable that large-scale and interactive visualization processing becomes possible through the dedicated use of PC cluster for large-scale visualization (VCC). Image Processing PC Cluster on Umemkita (IPC-C) is composed of 7 computing nodes, each of which has two Intel Xeon E5-2640 2.5GHz processors, a 64 GB main memory, 2 TB hard disk (RAID 1), and NVIDIA Quadro K5000. This PC cluster controls visualization processing on 24 screens. IPC-C is a cluster system which 7 computing nodes are connected on 10GbE. The peak performance of IPC-C is as follows. IPC-C has Windows 7 Professional and Cent OS 6.4 dual-installed as operating system. Users can select either of operating systems according to their purposes. The following software are installed on IPC-C.